Editor’s Note: As part of our ongoing series for our 25th anniversary year, this article published in January 1993 and written by James Netzel and Jon Hamaker of John Crane Inc., explained new technology to predict seal performance and improve design. Following the short excerpt below is a new article from the same company highlighting how computer aided engineering (CAE) is helping mechanical seals today. Information developed from these programs ensures compliance to the most stringent environmental regulations, before a pump and seal are put into service. Mechanical seals and mechanical seal technologies have evolved significantly since their inception in the mid-1930s. With the growing demand in a variety of challenging applications, there is a need for advancing computational technologies that are capable of analyzing critical applications and special designs. Technology development within and throughout the industry has had a positive impact on optimizing seal products. Some products that were designed using traditional computer aided engineering (CAE) tools are still running successfully in the field after more than 25 years, validating the technology behind CAE tools. Finite element-based computer programs are designed to analyze the operation and performance of contacting and noncontacting mechanical seal faces. 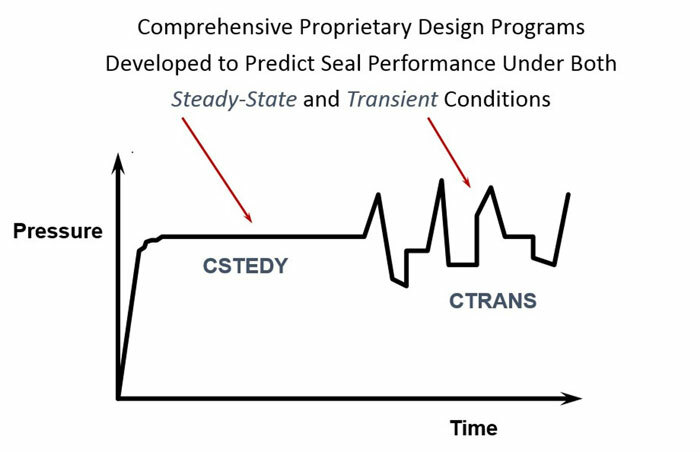 The seal analysis can be performed for steady state conditions for continuous operation or transient conditions that are time-dependent (see Image 2). These programs take into account the combined effects of pressure and temperature distortions, sealed fluid properties, friction at the interface and seal faces conditions. The comprehensive mathematical/numerical models that predict face seal performance are based on first principles and empirical data. This specialized software includes many features that support the requirements for analyzing mechanical seals that are not typically found within commercial FEA software. 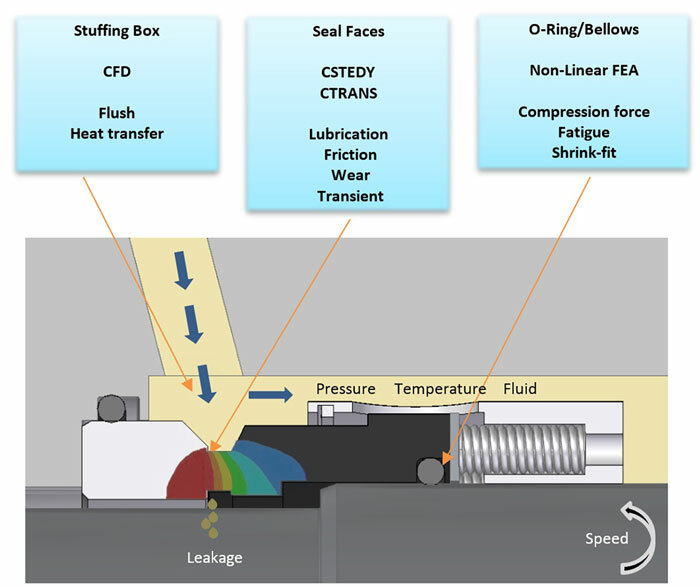 Engineers input seal component geometry, shaft speed, material properties, fluid properties, pressure, temperature and boundary conditions that define the seal environment. Based on these inputs, the software calculates seal performance values such as power loss, interface temperature, pressure distortion, thermal distortion, face gap, leakage, contact pressure, etc. The results are shown as numerical values or graphical interpretation (see Image 3). For certain applications, safety and reliability is of paramount concern. Pumps used in hydrofluoric (HF) acid alkylation units require a dual sealing system to minimize emissions. The use of a single cartridge mechanical seal in this hazardous service is not desirable, since any significant leakage past the inboard seal face could result in release of HF acid to the atmosphere.